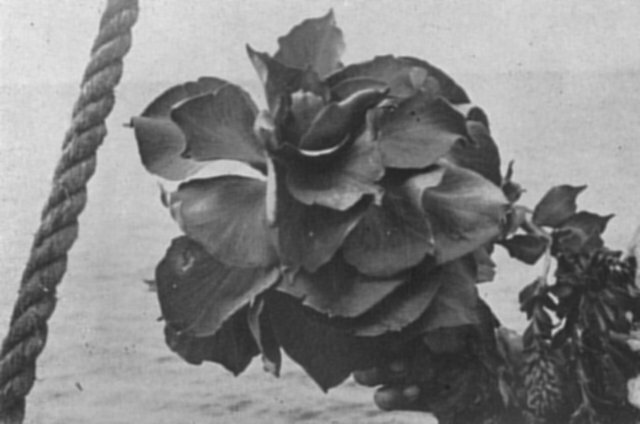 on Kerguelen is the only plant that grows on the Prince Edwards. INTEREST in the Prince Edward Islands was revived after World War II, but from a new angle - that of strategy. This time it was South Africa House in London that, in February 1947, recommended to the Union Government that it consider the part the Islands might play in the future of the country. The general question of claims to territory in the Far South was then being examined in London. During the war there had been strong cause for suspicion that the enemy had made use of some of the uninhabited islands in the Southern Ocean for sheltering their raiders and submarines and the supply ships that fuelled, watered and stored them, and for refreshing their crews. Cruisers and submarines were sent from the Cape to lie in wait at some of the islands, but they did not succeed in surprising the enemy. That the islands had in fact been used by the enemy was proved later when the naval records of Germany and Japan were examined by the victors. The author has in his possession a German newspaper published during the war which contains a description of a visit to Gough Island by a surface raider. The article is illustrated with a photograph of the island, taken from the deck of the warship. But it was not so much the use that might be made of these islands by the ships of a future enemy as the possibility of some of them being used as the launching platforms for an attack upon the Union itself that gave the General Staff at Pretoria cause for concern. guided missiles, and the further improvements that Britain and America had since perfected, satisfied the Union's defence chiefs that these weapons already had sufficient range and accuracy to make them a potential menace from a distance of 1,000 miles and more. It was generally accepted that the seaports would be the first objectives of attack, since without them the country could never effectively wage war. And there was one island group that was already probably within range of rocket weapons and other forms of guided missiles, all of South Africa's principal ports - Durban, Cape Town, Port Elizabeth and East London - being situated between 950 and 1,200 miles of it. That group was the Prince Edwards. In the wrong hands the Prince Edwards would be a definite menace to South Africa. Missiles fired from them would not only endanger the seaports but also the ships that passed round the southern end of Africa, and the coastal airfields from which their air escorts would have to operate. And they would need a flight range of only 1,350 miles to reach the very heart of the country and the centre of its war potential - the Rand. points in the ocean, retaliation with missiles from the mainland could hardly be effective. The concern of the General Staff was communicated to the Department of External Affairs, and inquiries were made from the British Government as to its plans for the islands. The British Government indicated that it had no immediate plans for effectively occupying them. Negotiations were then begun with a view to reaching agreement for the Union to occupy them and to establish sovereignty over them in the name of His Majesty's Government in the Union. It was intended that occupation should be maintained by the establishment of permanent meteorological stations on the islands. While these negotiations were going on the Union Government commissioned South-African born Professor Athelstan F. Spilhaus, the noted meteorologist who was now living in America, to report on the possibilities of improving its meteorological service. He was to include in his investigation the question of establishing stations on other islands in the Southern Ocean. He was, of course, not informed about the negotiations to annex the Prince Edwards nor that as a matter of policy it might be decided to make special provision to meet the cost and proceed earlier than might otherwise have been done with the erection of stations on these islands. place recording instruments on them as they went south for the catching season, picking them up on their way back. But now political factors began to force their way into the picture and to demand consideration. In the negotiation of peace treaties that resulted from the war attention was focused upon the redistribution and ownership of land, and that containing or likely to contain mineral deposits, particularly uranium, required for the production of atomic energy, was much sought after. Territory that was unoccupied, such as the majority of islands in the Southern Ocean and the Antarctic Continent itself, from which numerous explorers had brought back reports of the existence of mineral deposits, attracted greater interest among the nations than it had ever done previously. Though little of the territory at the bottom of the world was occupied, none of it was unclaimed. Even the almost unexplored Antarctic Continent had been claimed in toto as far back as 1840 by Sir James Clark Ross when, after his visit to the Prince Edwards, he reached that great bight which now bears the name Ross Sea, and after investigation concluded that what he and others had found above Latitude 65 degrees south during the past two decades were not isolated portions of land but parts of a whole. He thereupon claimed the whole Continent for Britain. The British Government, however, did not approve the claim made on its behalf, and took no steps to assert its title to the territory. International law lays down three requirements for establishing clear title to territory. First it must be discovered; then it must be entered and formally claimed; and finally it must be as effectively occupied and administered as local conditions allow. Should the claimant not complete all three stages, any other nation that does comply with those conditions not fulfilled by the original claimant may claim title. south were haphazard, based on the mere fact of discovery, formal claim, or temporary occupation. This was due partly to lack of interest in them in the past and partly to the handicap to permanent occupation occasioned by climatic conditions. Now there was no longer lack of interest in those territories, and Science had found ways and means of nullifying many of the harmful effects of the harsh climate. So the nations that were involved began investigating the history of their claims to ownership of unoccupied regions. Some pried into the title of others to land they had claimed. One or two that had previously shown little or no interest in that part of the world now began to cast their eyes in that direction. Argentina had long claimed the Falkland Islands that Britain occupied, and Chile also disputed the right of both Britain and the Argentine to occupy certain islands and portion of the Antarctic mainland south of Cape Horn. They chose the latter end of 1947, when Britain was preoccupied with economic and political troubles, to begin national campaigns aimed at forcing her to withdraw her claims to the disputed territories. the British claim to possession should it come into dispute. Britain informed South Africa of the situation. It became obvious that the wisest course would be to annex the islands formally, Britain having signified her assent, as quickly and unostentatiously as possible. Two ships of different nations that had not previously had interests in the Antarctic were known to be on their way there, and it seemed that there could be little to stop them, were they so inclined, from taking possession of the islands. The two vessels called at Cape Town and left for the south at the beginning of December. Not very long after reports began to circulate that one of them planned to land parties on unoccupied territory in the Southern Ocean and Antarctic, with a view to claiming occupation and legal possession.